You are here: Home / Travel / Akumal Swimming With Turtles For Free? 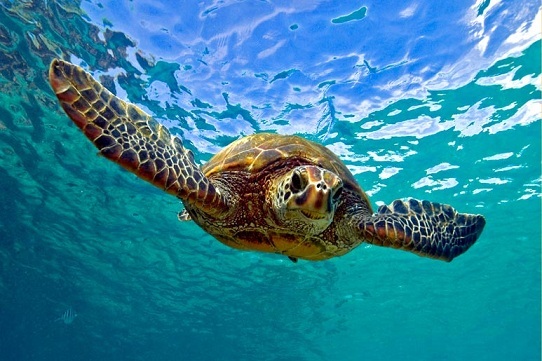 Recently someone posted a question on Tripadvisor asking if it is possible to take a taxi to Akumal, pay the entrance fee to the park, and then swim with the turtles for free i.e. without booking an organized tour? It is not necessary to book an organized tour, you can just do your own thing. Take a taxi and head out to Akumal Beach. The beach is a short walking distance (2-3 minutes) from where you get off the taxi. If you are not carrying your own beach towels, you can rent in loungers and chairs available on the beach. There are also two dive shops (the one nearest to the beach is just next to the Lol-Ha Restaurant) from where you can rent snorkeling equipment, lockers, life jackets etc. for roughly USD 18. No experience or tour guide is necessary. There are a surprising number of giant sea turtles feeding off the grasses in this beach area. Simply wade out in the water, follow the groups and the turtles are everywhere. Bring an underwater camera to get some great clicks and later have a yummy meal right on the beach at the reasonably priced Lol-ha restaurant.